This year, I received a CIAN student travel grant for conference travel. 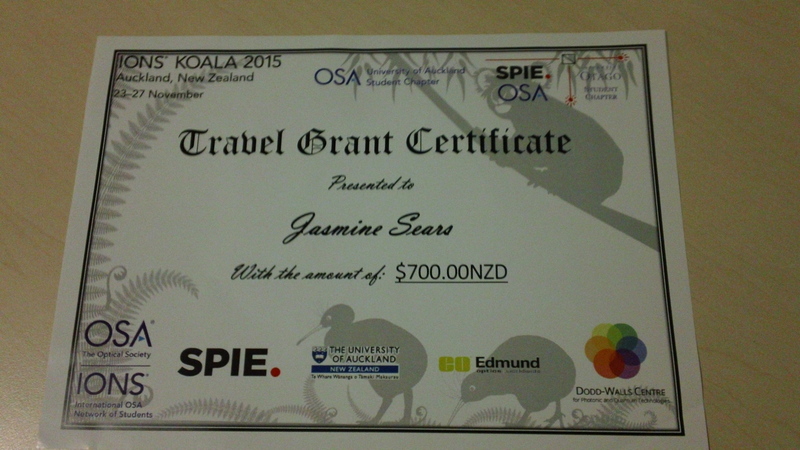 Thanks to this grant, I headed to New Zealand over Thanksgiving for the International Network of OSA Students Conference on Optics, Atoms, and Laser Applications (IONS KOALA). 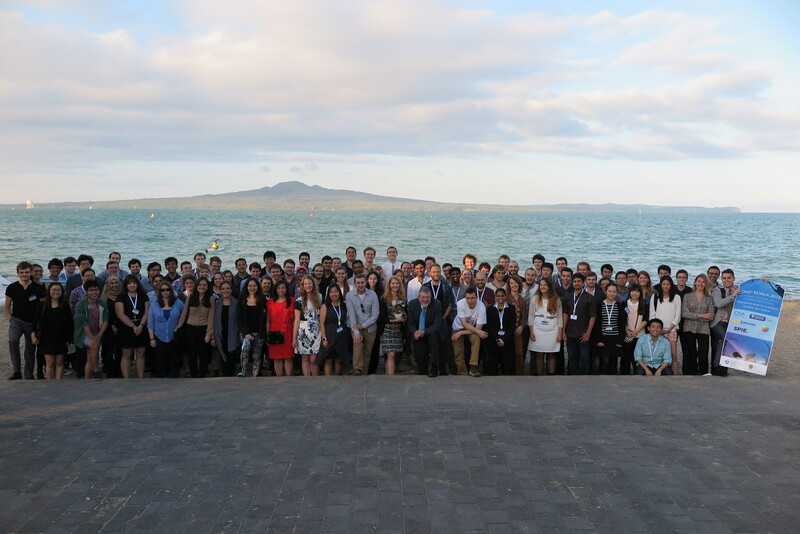 Throughout the week, I gave a presentation on my research, listened to students from around the world present their research, heard a talk by a Nobel laureate, and explored the city of Auckland! 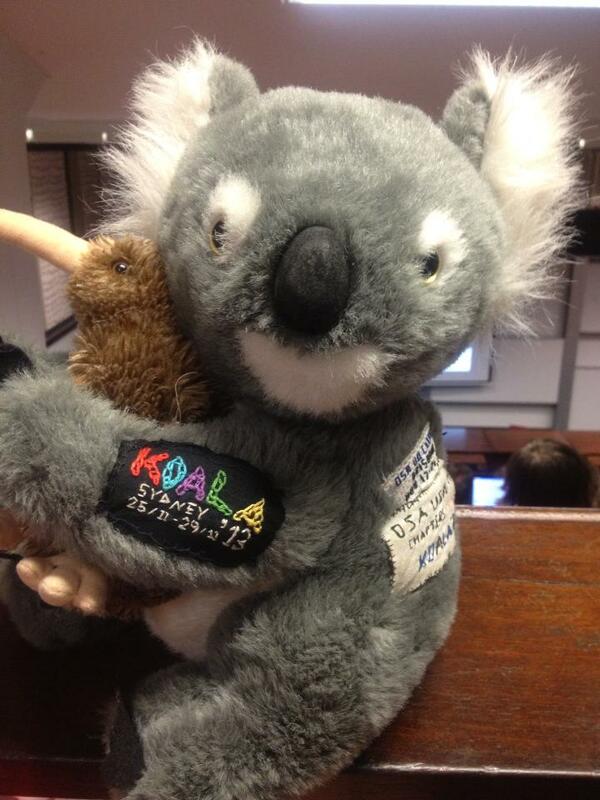 Each year’s organizing team adds a new patch, although the poor koala is starting to run out of space. This was a student conference, which showed in a couple of ways. We were told at the start of the conference that anyone going over their time limit (15 minutes for most talks) would get shot with a Nerf gun until they stopped talking. This was apparently a pretty effective threat, because only one presenter went over time. Also, the organizers went out of their way to ensure that the presenters felt encouraged; if no one in the audience had a question at the end of a talk, the session chair would always ask something. 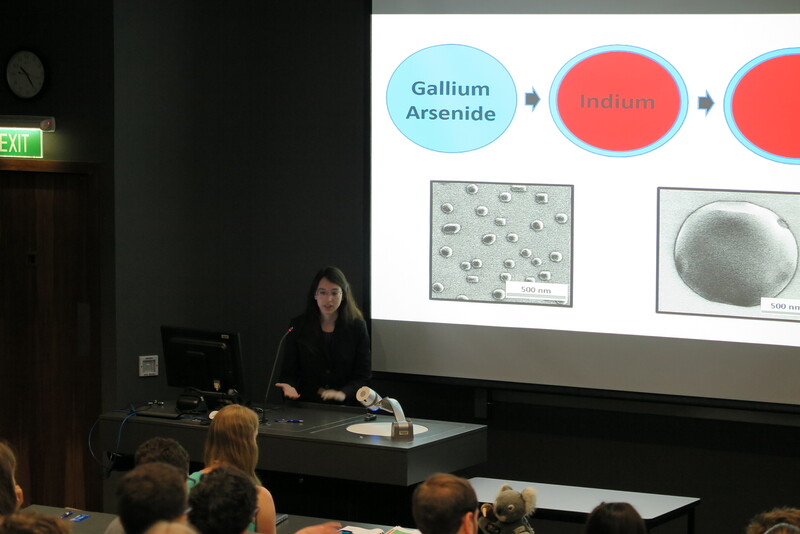 I gave one of the first talks of the conference (“Structure and Applications of Self-Assembled Indium Nanoantennas”), which meant the audience was really engaged and had a ton of questions. The rest of the week, people kept recognizing me and complimenting my presentation, so I think it went pretty well! The conference schedule was packed with around six hours of talks most days, plus evening events and social time. There were over a hundred attendees, including four plenary speakers (the only non-students allowed to present at the conference). My favorite plenary speaker was Bill Phillips, one of the recipients of the 1997 Nobel Prize “for development of methods to cool and trap atoms with laser light.” His talk covered Bose-Einstein Condensates and included some photos from Brian Anderson’s research (an OSC professor). The CIAN international travel grant was incredibly generous, but didn’t quite cover my entire trip. Transpacific flights are expensive! 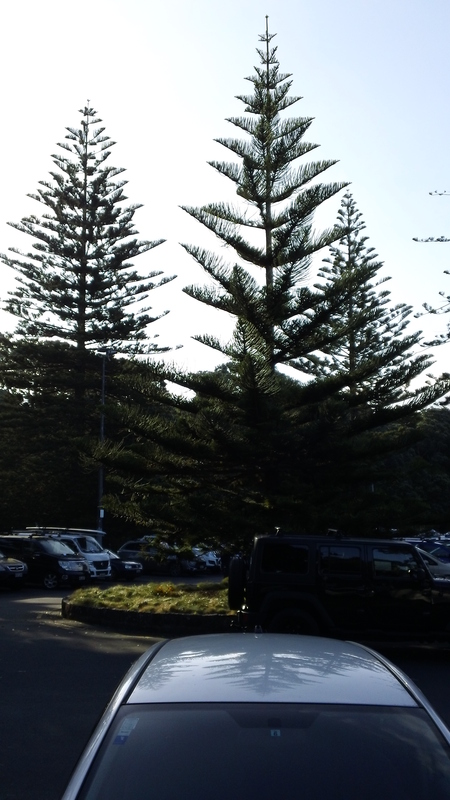 Apparently they’re Norfolk Island pines, not fake Christmas trees. IONS KOALA was a fantastic adventure, especially because the Student Optics Chapter at the University of Arizona was just informed that we’ll be hosting our own IONS conference in the Fall. I’m definitely looking forward to drawing on my experiences in New Zealand while helping organize an IONS conference here in the US. I hope we can replicate that atmosphere of enthusiasm for Optics! Jasmine Sears is pursuing her Ph.D. in Optical Sciences at the University of Arizona, having previously received her B.S. from Caltech. 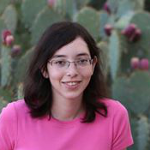 She works in the Quantum Nano-Optics of Semiconductors group under Professor Galina Khitrova, growing and characterizing quantum structures. She is also active in student government as the current Assembly Chair of the Graduate and Professional Student Council and an Outreach Co-chair of the Student Optics Chapter. Her interests include explaining cool science phenomena and making chocolates. This entry was posted in Education, Industry & You, Research and tagged College of Optical Sciences, Conference, New Zealand, Opportunity, Presentation, University of Arizona. Bookmark the permalink.